Five routes were selected by London Transport in 1994 to be operated by the first, experimental, low floor buses. 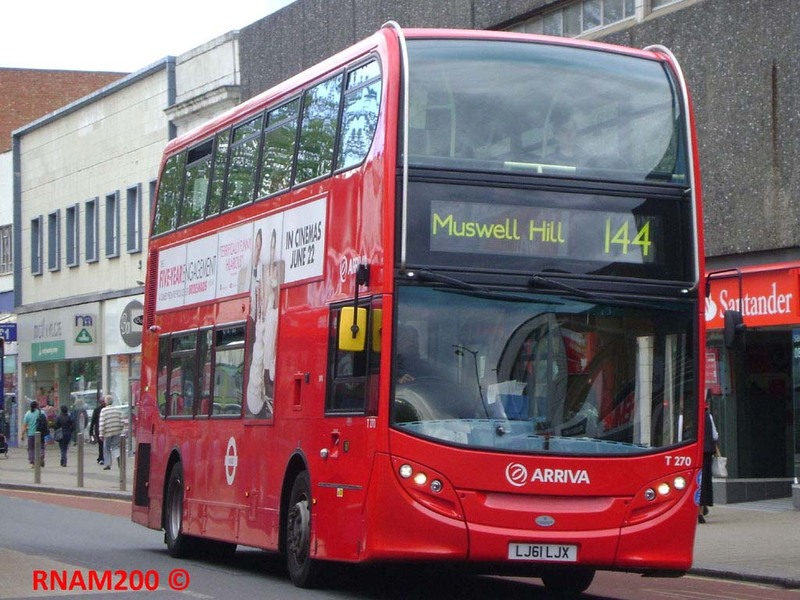 68 single deckers were purchased and placed into service by London Buses, the total including 30 Scania N113CRLs with Wright Pathfinder 320 bodywork, receiving the classification SLW, 14 of which were allocated to Wood Green garage for route 144 (Muswell Hill – Edmonton Green). They were later supplemented by a trio of DAF SB220s with Plaxton’s neat Prestige bodywork. Apart from airport work at Heathrow this type was unique to London – and did not last long in any case. Despite the frequency increase, the busy 144 was not the most suitable route for a single deck conversion, and the earliest opportunity was taken to convert it back to double deck operation. Naturally, converting the route back to standard floor buses in order to do so would not have been deemed acceptable, so the 144 had to wait until low floor double deckers appeared on the market. The engineering for a double decker is more complex, and it was not until the last months of 1998 that any low floor models entered service. Some of the first were those at Arriva, which had specified DAF DB250LFs supplied by sister company Arriva Bus & Coach, the dealer. DAF was the first to produce a low floor double decker, as it was able to modify its existing DB250 to low floor format, whereas the other manufacturers opted for completely new designs. The initial design did have some minor compromises, and needed an exemption from certain aspect of Disability Discrimination regulations on gangway widths and intrusions. Many of the early ones, classified DLA, went onto Wood Green area routes, including the 144. However, much of the DLA class has now been removed from London service and newer buses are now to be found on the 144. A new contract in October 2011 called for new buses, although these did not materialise until the following March. These were of the ADL E40D/Enviro400 type, and T270 (LJ61 LJX) approaches Turnpike Lane Station in Wood Green High Road on 18 June 2012. However, during 2013 new hybrid buses were introduced on route 29, and consequently the buses previously on the route were displaced and moved over the the 144 among other new homes. They had only intended to be temporary on the 29 in order to effect an early conversion of the 29 from bendy buses to conform to the Mayor's pledge to withdraw the latter by the end of 2011, the 29 contract having another year to run at the time. The buses are of the DW type which is really the successor to the DLA, but with Wright Gemini bodywork instead of Alexander, and a much updated chassis and engine. 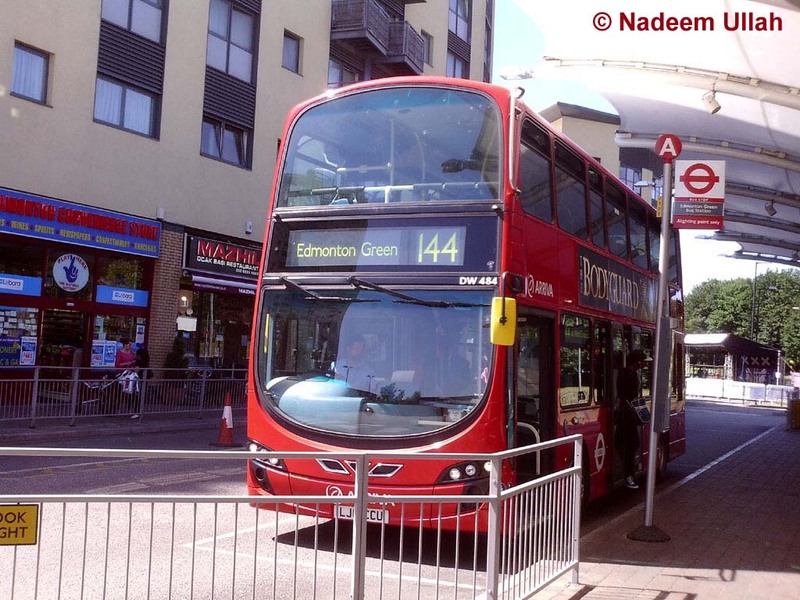 DW484 sets down passengers at Edmonton Green bus station on 1 August 2013. The DLAs and DWs have been the major double deck classes for Arriva London, but another which was amassed intermediately was the VLW class Volvo B7TL, again with Wright bodywork. Arriva actually received the very first buses built to this revolutionary design with a speculative order for 50 of the type (that is to say, not ordered in respect of specific requirements – unusual in London's regimented contractual environment). These buses were allocated to Wood Green and although many have now been displaced, the class is represented on the 144 by VLW7 (LJ51DFL) again in Wood Green High Road on 25 November 2011. The present-day 144 actually started its existence in 1982 under the number 144A. The established 144 ran from Muswell Hill via Turnpike Lane Station, Westbury Avenue, Great Cambridge Road, Silver Street, North Circular Road, Woodford Avenue and Gants Hill to Ilford. 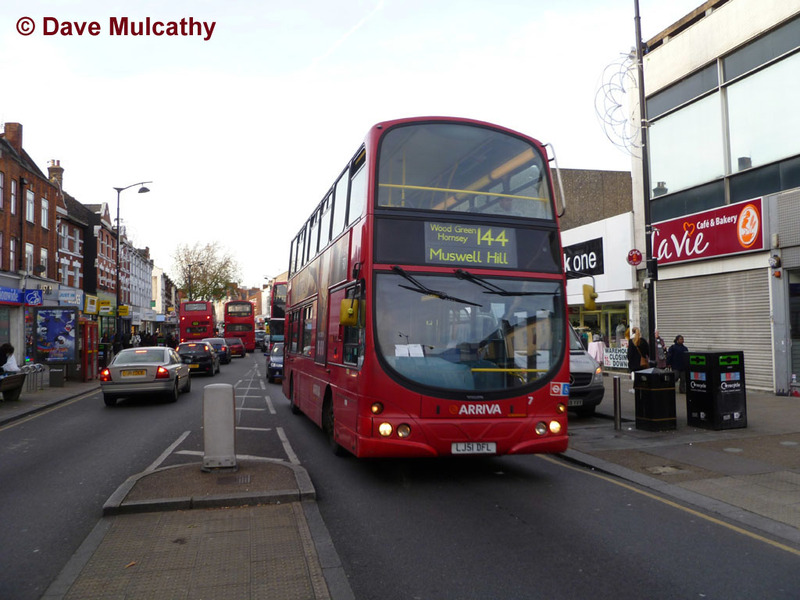 One of the few new routes introduced in the September 1982 cut-backs was the 144A, and this was genuinely a new route, replacing only a short section of the 144 between Muswell Hill and Turnpike Lane. Although it paralleled the 144 to some degree, it served the shopping area of Wood Green and diverted at Edmonton to Edmonton Green. This route quickly became busier than the parent 144, and in 1991 the 144 was renumbered 444, in turn allowing the 144A to lose its suffix when the SLWs were introduced in 1994.